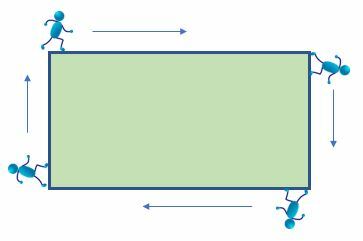 Welcome to page all about 'What does perimeter mean'?. We will explain what perimeter is and how you can measure it. There will also be links to some of our other perimeter pages. It is measured as a length and can be in a range of units such as cm, inches, feet, miles, etc. 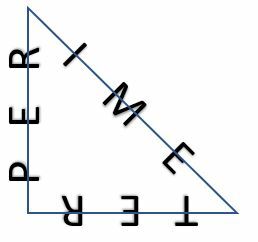 In the triangle below, the word 'perimeter' has been written around the outside going all the way round the triangle to show what the perimeter represents visually. One way I like to imagine perimeter is if you dropped a tiny stick-person on the outside of a shape. The stick-person walks all the way around the outside of the shape until they got back to where they started. The distance the person walked would be the perimeter of the shape. How do you find the perimeter? To find the perimeter of a shape you basically just need to add up the length of each of the sides. If the shape is drawn accurately to scale, you can simply use a ruler and measure the length of each side and then add up all the lengths to find the perimeter. However you will often be required, particularly at a higher level, to use geomtric properties of shapes and formulas to work out some of the missing lengths of shapes which are not drawn to scale. To help you further understand what does perimeter mean, we have looked at working out the perimeter of some 2d shapes below. How to find the perimeter of a rectangle. To find the perimeter of any shape we just need to add up the length of each side. In any rectangle, however, opposite sides are always equal in length. 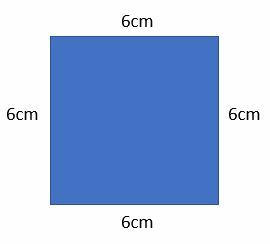 The perimeter of a rectangle can be found by adding the length of the 2 adjacent sides together and doubling the answer. Another way to find the perimeter quickly is to double the length of each of the adjacent sides and add them together. Perimeter = (length x 2) + (width x 2). The perimeter of the rectangle above is 7 + 2 + 7 + 2 = 18cm. However, we could also just work out (7 + 2) x 2, as we are simply adding 7 plus 2 twice. This rectangle is actually a square. The perimeter is 6 + 6 + 6 + 6 = 24cm. As all the sides of a square are the same length, we just need to multiply the length of one side by 4 to find the perimeter. So 6cm x 4 = 24cm. A rectilinear shape is a closed shape made up of just vertical and horizontal lines. To find the perimeter, we simply need to add up the lengths of the sides. If the length of the sides are not given, we will need to measure them first. If the shape is not drawn to scale and several lengths are missing, we will need to use our logical thinking and calculation skills to find the missing lengths. To find the perimeter of the shape, we just need to add up the length of each of the sides. Since all the sides have been given to us, we just need to add them up. So the perimeter is 8 + 3 + 5 + 1 + 3 + 2 = 22cm. In this particular example, there are two sides missing. However, if we look at the missing side on the left hand side, we can see that it is a long vertical line which is the same length as the two vertical lines on the right hand side put together. So this missing side must be equal to 5cm + 3cm = 8cm. If we now look at the other missing side, it is a short horizontal line. You can see that the length of this line added to the 5cm horizontal line is the same length as the 7cm long horizontal line. So the length of the other missing side must be 7cm - 5cm = 2cm. Now that we have worked out both missing sides, we can finally find the perimeter of the whole shape. So the perimeter of the shape is 30cm. How do we find the perimeter of regular shapes? Well, a regular shape is a polygon that has all sides and angles equal. When we are looking at perimeter, it is the 'all sides equal' part that we are interested in. To find the perimeter of a regular shape, we simply need to multiply the length of one side by the number of sides. Find the perimeter of this equilateral triangle. This shape is an equilateral (regular) triangle with 3 equal sides. So the perimeter is the length of one side multiplied by 3. So the perimeter is 15cm. Find the perimeter of this regular pentagon. This shape is a regular pentagon with sides length 8cm. Find the length of each side of this regular octagon. This shape is a regular octagon and we are told that the perimeter is 24cm. We have to find the length of one side. So the length of each side is 3cm. The perimeter worksheets are all graded in order from easiest to hardest. find the perimeter of rectilinear shapes. The area sheets are all graded in order from easiest to hardest. 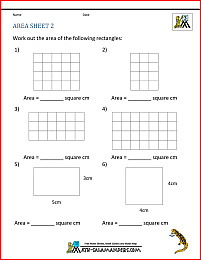 find the area of rectilinear shapes. Another way to learn about 'What does perimeter mean' is through exploring shapes. This online area and perimeter activity by toytheater.com will let you explore 'what does perimeter mean' through creating your own shapes.